The Mal-Shi is a cross between a Maltese and a Shih Tzu. This hybrid originated in the United States. 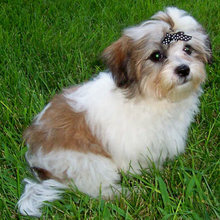 It is also known by Shih-tese, Shihtese and Malti Tzu. The Maltese is a small, fearless and very playful dog with a long, white silky coat that is hypoallergenic (very low shed cycle). Maltese do very well with other animals, but are often leery of strangers. The Shih Tzu is a medium sized and more sturdy breed with a double coat that is very people focused and literally thrives on attention and affection. The combination of these two breeds produce a cute, sturdy, intelligent, family focused dog with a slow shed cycle. The Mal-Shi will grow between 5-15 pounds and will reach a height of 8-14 inces. The MalShih coat typically resembles that of a standard Shih Tzu with less, or no, undercoat. Like the standard Shih Tzu, the Mal-Shi does not shed as like most breeds do, but rather lose hair slowly like people. Most owners keep their Mal-Shi in a puppy cut (coat trimmed short) and others groom them daily using the traditional top knot and center part. The Mal-Shi is typically a fast, friendly, family focused pet with a very playful personality. They are usually easier to train, and require less attention and affection than the standard Shih Tzu but are often aloof with strangers. Early socializing with children, friends, animals and travel is recommended. The Mal-Shi is typically a fast, friendly, family focused pet with a very playful personality. They are usually easier to train, and require less attention and affection than the standard Shih Tzu but are often aloof with strangers. Early socializing with children, friends, animals and travel is recommended. The Mal-Shi is an intelligent, loyal, playful breed that requires moderate exercise and mental stimulation. Though quite independent, they are very eager to please and easily trained. They do well with older children, nearly all animals, and with those of whom they are accustomed. They are alert, agile and highly perceptive. They're not overly vocal and often fearful of strangers, making them a poor candidate for watchdog. You can find Mal Shi puppies priced from $250 USD to $2000 USD with one of our credible breeders. Browse through our breeder's listings and find your perfect puppy at the perfect price. The Mal-Shi is an intelligent, loyal, playful breed that requires moderate exercise and mental stimulation. Though quite independent, they are very eager to please and easily trained. They do well with older children, nearly all animals, and with those of whom they are accustomed. They are alert, agile and highly perceptive. They're not overly vocal and often fearful of strangers, making them a poor candidate for watchdog. The Mal-Shi typically requires three or more puppy cuts (trimmed short or shaved) per year. If supporting a full coat or 'show coat' daily brushing and the traditional center part and top knot, like the Shih Tzu, is the most common grooming regimen. A first generation Mal-Shi is typically a highly intelligent focused dog. General speaking, in comparison to training a Shih Tzu, the MalShih is a star pupil. The MalShih is usually quite perceptive and eager to learn and comply, making them a good choice for first time dog owners or those lacking the patience and training skills required for formal housetraining. Early socializing with children, friends, animals and travel is recommended. Mal-Shi are house pets in need of protection from extreme temperatures and they require plenty of exercise and playtime. A brisk twenty minute daily walk may do the trick, but don't neglect to fulfill their never ending desire to run, chew and play. A bored lazy Mal-Shi is likely to become depressed, destructive, disobedient or even worse, missing. Be careful not to overexert or overheat your Mal-Shi, as most have more gumption than stamina. When a white froth begins to form around the mouth, or when their breathing becomes extremely labored, you should begin slowly winding down to a stop. Avoid abrupt stops to strenuous exercise and do not allow them to over drink or eat prior to or after exercise. Mal Shi Puppies for Sale - Shipped Worldwide! Finding the right Mal Shi puppy can be dog gone hard work. PuppyFind® provides a convenient and efficient means of selecting and purchasing the perfect Mal Shi puppy (or Mal Shi puppies) from the comfort of your home, 24 hours a day, 7 days a week. Take advantage of our PuppySearch or leisurely browse our directory of hundreds of dog breeds, Mal Shi dog breeders, Mal Shi dogs for adoption, and Mal Shi puppy for sale listings with photos and detailed descriptions. Some Mal Shi puppies for sale may be shipped Worldwide and include crate and veterinarian checkup. Many Mal Shi dog breeders with puppies for sale also offer a health guarantee. With thousands of Mal Shi puppies for sale and hundreds of Mal Shi dog breeders, you're sure to find the perfect Mal Shi puppy.